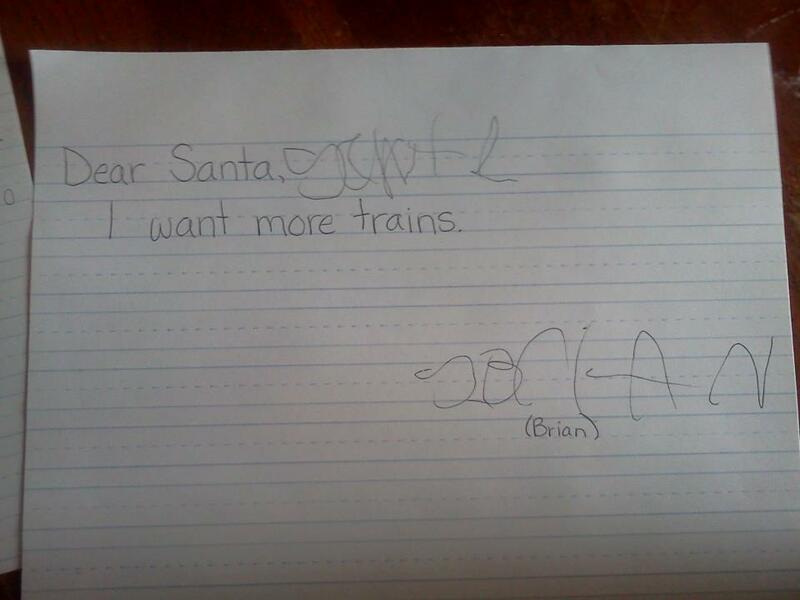 Perhaps the most simple letter Santa has ever received, but actually the first one I’ve tried to get Brian to write. Prior to this year I always just had Corbin write a line in his letter for his brother. 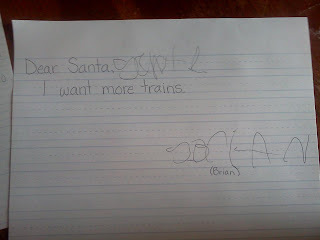 Speaking of which Santa, it would be killer if you could make the connections in my brain work easier so I could find the words I want to say when I want to say them. It really blows when I can’t tell people that I want to listen to the Bee Gees or can’t tell them that I’m hungry or that I just need to use the bathroom. Also if it isn’t too much could you make the bathroom more sensory tolerable? And maybe just take away all the anxiety I have around going to the bathroom. You see, I’m often constipated (sorry for TMI Santa! ), and because of the years of being constipated I’ve developed some REAL anxiety around the bathroom. Could you take away my intolerances and heal my gut-brain connection too? I really hate having to always watch what I eat and then being sick for days because I climbed the counters and ate something I wasn’t suppose to. I’d really like to be able to eat apples again- they are my favorite- but I break out into rashes and become SUPER hyper (more like manic but I try not to use that word) every time I try to eat one. I’d like for clothes to not bother me so much. I’m seven now Santa and I know it’s funny for me to only want to wear pajamas but really they are the most comfortable thing out there! You could just buy me a whole wardrobe from Soft! Their clothes rock but my Mom doesn’t have the money to replace my whole wardrobe. 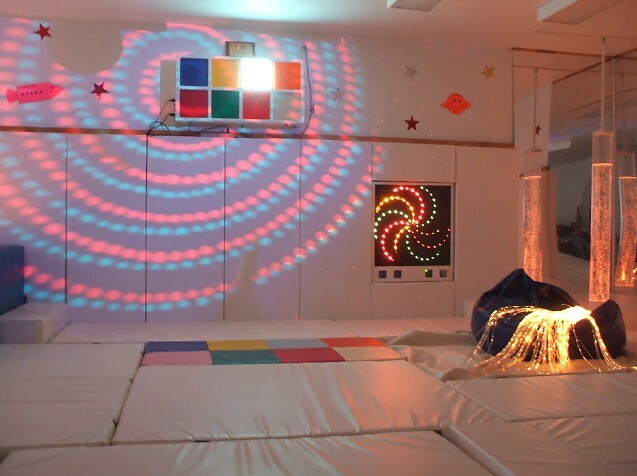 I’d like to have a sensory room Santa! Complete with mats, huge beanbag chairs, tube lighting, a ball pit, a squeeze machine, a variety of swings, scooter boards, and a huge boatload of fidget toys. Some tunnels, body socks, and weighted blankets too! I’d love to have a room to escape to when I’m feeling overwhelmed! Could you open a school in the area that gives kids of ALL abilities an equal playing field? Using an alternative way to teach kids like me who aren’t very strong in the language area. I’m very smart Santa but sometimes people have a hard time figuring out how to unlock that. Santa, I’d really like to make some friends. Kids at school are very nice to me but I have a hard time making real friendships because of my language (refer back to my first wish please) and I have a hard time reading social cues (in fact, I’m not even sure what that means I just hear the grown ups around me saying it). Sometimes I try to get close to other kids but I guess I get too close and they also don’t seem to like it when I pick the lint and hair off of them. I could really use some help in this area! Santa could you somehow spread a bit more compassion into the world? My big brother has had kids tease him for having a brother with autism, my mother has had strangers advise her on what bad parenting skills she must have because her child is throwing a fit in the grocery store (sensory overload! ), and I get stares every time we go out to eat. The stares don’t bother me too much Santa but I see the pain on my Mom’s face. They bother her no matter how strong she pretends to be.